The Cosmedic Room offers various beauty treatments including wrinkle relaxation treatments, dermal filler and roller treatments, and beauty therapy. Based in Penrith, we offer free consultation and advice on the treatments and services listed below. More and more people are having a variety of rejuvenation techniques to help their face reflect the way they feel inside. One such rejuvenation technique is wrinkle relaxation treatment. This minimally invasive treatment can be used to relax the specific facial muscles that cause upper facial lines (crow’s feet, forehead and glabellar frown lines) to form. With skilful use, your own natural facial movements are retained so you look natural but relaxed and refreshed. We discourage the creation of a "frozen" or "deer in the headlights" appearance as this is not attractive and looks artificial. The following information explains how wrinkle relaxation treatment works and what is involved with the treatment. In Australia there are three brands of anti-wrinkle injection and they known by the names Botox, Xeomin and Dysport. All are types of botulinum toxin Type A.
Wrinkle relaxation treatment involves a natural purified protein (botulinum toxin A, Botox, Xeomin and Dysport) that relaxes wrinkle causing muscles thereby creating a rejuvenated appearance. The active ingredient in wrinkle relaxation treatment is derived from bacteria in much the same way penicillin is derived from mould. It is manufactured in sterile laboratory conditions. The treatment is a prescription-only medicine and treatment is only available from a qualified medical professional. It is registered for the treatment of crow’s feet (the lines that radiate from the corner of your eye when you smile or squint), forehead lines (the horizontal lines that form when you raise your eyebrows) and glabellar frown lines (the vertical lines that appear between your eyebrows when you frown). Botox, Xeomin and Dysport are types of botulinum toxin A. The dose of Botox, Xeomin and Dysport is measured differently (like measuring a length in inches or centimetres). Consequently, to get the same effect, about two and a half or three times as many units of Dysport are required to get the same effect as one unit of Botox or Xeomin. This is not because one is weaker or the other is stronger. They are simply measured differently. However, this is relevant when comparing quoted price per unit. Dysport is less dollars per unit - but you need to pay for more units. Many facial wrinkles occur when we use our muscles to form facial expressions. The wrinkles formed during these expressions are called dynamic wrinkles. For example, when we smile our eye wrinkles become prominent and when we frown the vertical lines between our eyebrows become noticeable. When we are young, our skin springs back to its initial position after facial expressions. However, as we get older, dynamic wrinkles remain on the skin to form static wrinkles. These are the wrinkles and folds that then remain present even at rest. This process occurs because natural substances such as collagen (the major structural protein in the skin), elastin (the protein that causes tissue to stretch) and hyaluronic acid (which gives skin volume) decrease with age. This, together with environmental factors such as exposure to sunlight, smoking and stress, all contribute to the creation of wrinkles and folds. The advantage of commencing anti-wrinkle treatments at an earlier age is that the formation of static lines is lessened as the dynamic movements which cause them are weakened. Wrinkle relaxation treatment is a non-surgical procedure whereby a small amount of product (Botox or Dysport) is administered into selected facial muscles by a trained medical professional using a very fine needle. Generally, the treatment takes around 10 minutes. Discomfort is minimal and a mere pinprick sensation. There is some minimal discomfort as the product flows into the targeted area. The injection site may sting for a few seconds. At times, there is some minimal bleeding from the pinprick site. This may cause a minor bruise which is easily concealable with make-up. After the injection it takes 2 to 3 days for the treatment to begin taking effect and about 7 to 10 days to see the full effect. The dose recommended for the treatment will vary depending on your individual situation and the severity of your lines. Your doctor will advise the best dose for you to achieve the effect you are looking for and which muscles to inject to give you the best results. The effect can last up to 4 months before lines slowly begin to return. If you have repeat treatments then effect tends to last longer as the muscles causing the lines have been weakened by being inactive. Does wrinkle relaxation treatment cause more wrinkles to form? The treatment will relax the facial muscles that cause expression lines. It does not cause more wrinkles to form. If you choose not to have further treatments then the effect will wear off and your muscles will eventually return to normal activity. Your wrinkles will gradually revert to their pre-treatment levels. Will facial expression be affected by wrinkle relaxation treatment? The treatment works specifically on the muscles treated. This means that any muscle left untreated, including untreated facial muscles, should not be affected by the treatment. Your doctor will determine the best dose for you and which muscles to inject to give you the best results. In addition to its use for cosmetic reasons, the product used in wrinkle relaxation treatment is also used to treat patients in a variety of therapeutic indications including cerebral palsy in children, movement disorders (head, neck, shoulder, face), and axillary hyperhidrosis (excessive underarm sweating). In the amounts used for the treatment of upper facial lines, the side effects are usually temporary and localised to the area of injection. Possible side effects include headaches, pain, burning/stinging, bruising, swelling or redness at the injection site, local muscle weakness including drooping eyelids/eyebrows, swollen eyelids, skin tightness, tingling sensations, itchiness, nausea and flu like symptoms. To avoid eyelid drooping it is important not to rub the area of injection for at least four hours after injection to avoid the product being squeezed under the skin to muscles it was not intended to affect. Are anti-wrinkle injections and fillers (dermal fillers) the same thing? No. They are completely different products with different modes of action. Anti-wrinkle injections work by temporarily blocking nerve function to selected tiny muscles in the face. Dermal fillers are substances which are injected into carefully selected areas of the face to replace age related volume loss and thereby "fill" and remediate the appearance of sagging and wrinkles. How long has wrinkle relaxation treatment been used? The treatment has been used in Australia and New Zealand in therapeutic treatments for over 15 years. It was first approved for use in Australia for movement disorders (eye and face) in 1993 and for eye spasms and crossed eyes in New Zealand in 1991. Anti-wrinkle injections are the most common treatments in use for facial rejuvenation. Millions of individual treatments have been performed worldwide. Can wrinkle relaxation treatment be combined with other products and procedures? Many people use a combination of cosmetic products and/or procedures with wrinkle relaxation treatment. Botulinum toxin, coupled with dermal fillers, skin needling and laser facial rejuvenation etc provide a variety of modalities to "freshen" your facial appearance while avoiding surgical intervention. Your doctor will advise you as to whether or not you will receive better results if your treatment is combined with other products and/or procedures. (The terms botulinum toxin A, Botox and Dysport are included in the narrative to provide clear, unambiguous information and explanation regarding what are anti-wrinkle injections and for the purpose of informing the reader prior to the obtaining of informed consent). Dermal fillers are used to replace volume loss in the face. There are a number of compounds used as fillers but the most commonly used and safest (and reversible) is a non-animal based purified complex sugar which is present naturally in everyone. It is now produced by bacteria and purified. It is therefore not of animal origin. What are some effects of ageing on the face? The natural process of aging produces some loss of volume from areas of the face resulting in a sagging appearance. In the past it was considered that an aged appearance was the result of the action of gravity on the face. However, it has been realised that volume loss and not gravity has the most effect. What are dermal fillers and how do they counter some of the effects of ageing? Use of dermal filler for the lips. The injection of dermal filler into the lips will make them lips fuller in appearance. With age, lips undergo an involutional change which lip enhancement with filler reverses. Additionally, the skilful use of dermal fillers will enhance the fullness and curvature of lips for those desiring this effect. It is important to have a feeling for the aesthetic when performing filler injections. When skilfully done, filler injections fill and act to make wrinkles and creases less obvious and smoother. The folds on either side of the nose (nasolabial folds) are made less prominent when filled and made shallower. Thin skin can appear better hydrated and furrows and static lines are filled out. Fillers are also able to subtly enhance, restore shape and add definition to facial features such as the cheeks and upper cheeks. Backs of hands can be treated with dermal filler as can tear troughs, chins and nose. What happens during a treatment with dermal filler. Prior to the procedure anaesthetic cream may be used. This may take 20 to 30 minutes for the desired effect. In some situations local anaesthetic may be injected to produce numbing of the skin or lips. How long lasting is the effect of treatment with dermal filler? Depending on the site of injection and the type of filler, the effects can last 6 to 18 months. Dermapen is the latest innovation in skin needling and collagen induction therapy and is quickly becoming the optimal choice in skin rejuvenation due to its low risk profile and minimal downtime. The Dermapen has become the new industry standard for skin needling, providing excellent results. This revolutionary device is simple, yet powerful with many distinct advantages over dermal rollers, taking skin needling treatment to new heights. The Dermapen™ method of skin needling is particularly beneficial in patients with typical signs of aging and photoaging of the skin. The Dermapen method of skin needling is collagen induction therapy and it stimulates the production of collagen, ramps up the repair process and it improves the tone and elasticity of the skin. Effect on fine facial lines? It reduces the appearance of fine wrinkles and facial lines. Even after the first treatment, the skin is more supple, firmer and tighter. After a series of several treatments each spaced weeks apart, the appearance of fine wrinkles becomes less visible on the face and is particularly beneficial for upper lip vertical lines which are difficult to treat otherwise. A published study by Professor Tony Chu found the Dermapen to be an effect and beneficial treatment when used for acne scarring to the face. The advantage of Dermapen over the skin roller method of needling. The dermal needle roller, simply due to its shape, makes it difficult to treat certain hard to reach areas such as those around the eyes, nose and mouth. The Dermapen™ tip has a much smaller surface area which comes in contact with the skin and this allows it to reach and treat areas easily compared to the dermal roller. The most important difference between dermal rollers and the Dermapen™ lies in the effectiveness of the two technologies. 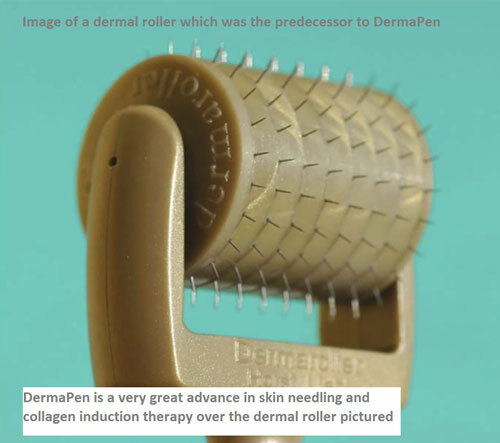 A published study by Professor Tony Chu, consultant dermatologist at Hammersmith Hospital in London, compared Dermapen and conventional dermal rollers. His study concluded that needling with the Dermapen was associated with less pain for the patient. There was less social downtime and the Dermapen was more effective in achieving the visible results than the dermal roller. The effectiveness of Dermapen lies chiefly in the very large number of micro-punctures a device is able to deliver. The more micropunctures, the greater the collagen induction effect and the more visible and dramatic the results will be. With the majority of dermal rollers, the maximum achievable number of holes is somewhere between 300 and 400 holes per second. This appears to be a lot of holes in the skin but is actually relatively small when compared to the number of micro-punctures created by the Dermapen™. The Dermapen has a 12-tip needle head and a motor that produces close to 110 revolutions per second. Thus the Dermapen™ is able to deliver a large number of skin penetrations per second per unit area which in turn produces results better than the conventional dermal roller. What skin types (Fitzpatrick Skin Types) can be treated? Dermapen treatment may be performed on all skin tones reducing the risk of post inflammatory hyperpigmentation or fibrotic scar formation. What conditions can be treated with Dermapen? Current indications for application of the Dermapen include aging related wrinkles and fine lines, abdominal stretch marks (striae), ultra violet (sun) damage, both hypo and hyperpigmentation, vitiligo, rosacea, telangiectasia, problematic acne, dilated skin pores, milia, keratosis pilaris, scarring, alopecia. Lines and wrinkles on the decolletage can be effectively treated. Multiple treatments produce a more visible beneficial effect. Generalised rejuvenation can be achieved in as little as 3 treatments. Scarring and stretch marks may require a minimum of 5 treatments. Treatments are performed every 4 to 8 weeks. Who is Dermapen not for? If you are taking warfarin, heparin injections or other anticoagulant tablets (eg Pradaxa) then the anticoagulant effect of these medications precludes you from skin needling due to the excessive bleeding which would result. If you are taking anti-platelet medications such as aspirin or clopidogrel then your doctor at The Cosmedic Room will discuss matters with you Some people have a "needle phobia". While at The Cosmedic Room we use local anaesthetic cream on the face, the cream may leave some areas of the face less numb than other areas. The Dermapen's method of action greatly diminishes discomfort compared to dermal rollers and the oscillating system further increases tolerance by diffusing nerve sensation. We offer very effect laser facial revitalisation procedures with our Picosure laser's Focus lens system for those intolerant of needling. The presence of active "cold sores" (Herpes simplex virus) means skin needling will need to be postponed until the areas are well healed People with allergy to local anaesthetic (lignocaine) cannot have lignocaine applied.